Two little British war orphans had a day they would surely never forget thanks to the generosity of American troops stationed at RAF Barkston Heath. In a fund-raising initiative by American military news media channel Stars and Stripes, a voluntary pay day collection amongst officers and men of the illustrious Fourteenth Troop Carrier Squadron exceeded expectations. The result was not one 'adoption' of an eligible British child, but two, records the squadron war diary. "In this the Fourteenth stands alone, every other Squadron in the Group, including HQ Squadron, raised money enough to adopt one British child. But the Fourteenth now has a small boy and his sister calling it Uncle." 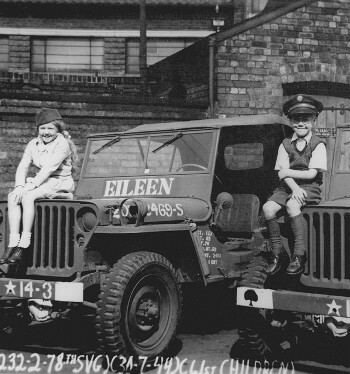 The diary simply has the childrens' Christian names and ages, eight year old Ronald and his ten year old sister Eileen who arrived at Barkston Heath on 29 July 1944 - Eileen's birthday - to spend the next day as squadron guests. "They were feted at a special dinner, they were guests on a neighbouring farm, they posed for photographers, including Larry O'Reilly of American Pathe News and they had the run of the base," a diary extract confirms. "Ronald was made an honorary captain in the Air Force and claims the distinction of being the only soldier on the base to monkey with the Colonel's should eagles and still stand in good stead. "And Eileen left with her bag weighed down with birthday money and a huge cake cut in her honour"
The story made the front page in the Grantham Journal and the Fourteenth is reported as having bought 100 copies.